The Womxn of Color Symposium: Finding and Using Our Voice will offer a day of empowerment, dialogue and professional development for students, faculty, staff, alumni and community members. 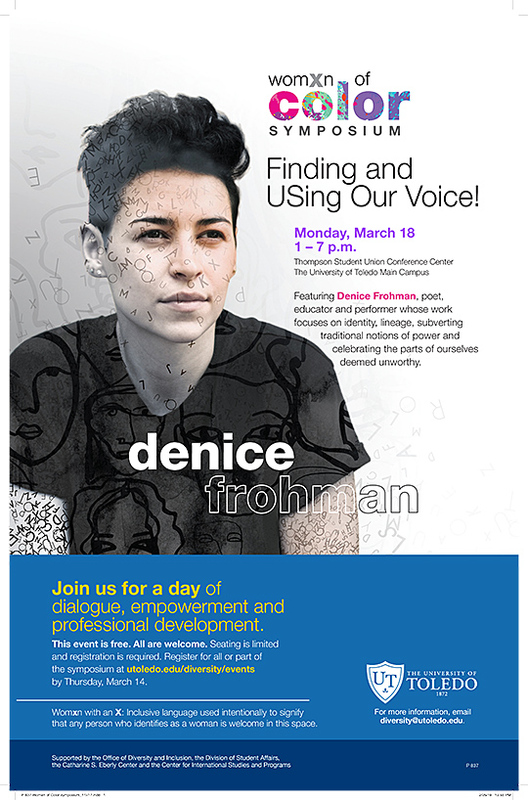 Denice Frohman, poet, educator and performer, will deliver the keynote address focusing on identity, lineage, subversion of traditional notions of power, and celebrating aspects women deem unworthy. “This is the second year for the Womxn of Color Symposium. 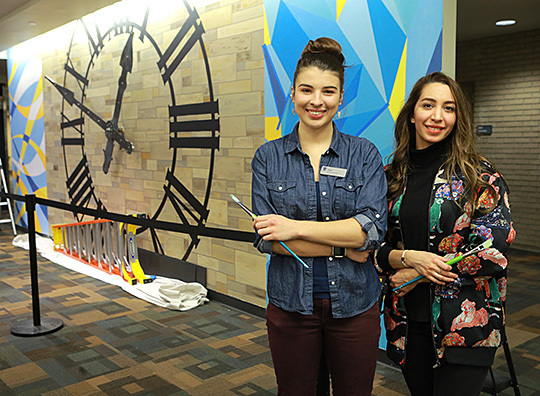 The symposium offers a space for womxn of color to discuss shared and divergent experiences, and connect and build a network of support to maximize self-actualization in our society,” said Malaika Bell, program manager for the Office of Diversity and Inclusion. “Charlene Gilbert, dean of the College of Arts and Letters, an academic and leader, will start the day’s conversation. During dinner, we will wrap up with Denice Frohman, a queer, Puerto Rican poet, performer and activist,” Bell continued. The committee chose to use womxn (with an “x”) to emphasize that the symposium embraces an intersectional approach and is inclusive of all womxn: transgender womxn, womxn of color, womxn from developing countries, and any womxn who feel marginalized by society’s expectations of women. The Womxn of Color Symposium will take place Monday, March 18, from 1 to 7 p.m. in the Thompson Student Union Ingman Room. Frohman will speak at 5:30 p.m. Registration is required for this free event, which includes dinner; go to the Office of Diversity and Inclusion website for more information and to RSVP by Thursday, March 14. The University of Toledo Department of Music will welcome two outstanding guest composers for its 42nd annual Spring Festival of New Music. Twice named among the top 10 most performed living classical composers by orchestras in the United States, Grammy-nominated Schoenberg’s music is “invigorating” (Los Angeles Times), and full of “mystery and sensuality” (The New York Times). His works have received performances and premieres at the Library of Congress, Kennedy Center, New York Philharmonic, Cleveland Orchestra, Dallas Symphony Orchestra and Hollywood Bowl. • Sunday, March 17 — Large Ensembles Concert at 3 p.m. in Doermann Theater — ticketed event. Tickets to the Saturday and Sunday concerts are $10 and $5 for students, children and seniors. They are available on the School of Visual and Performing Arts website. Tickets also are available at the door or by calling the Center for Performing Arts Box Office at 419.530.2787. 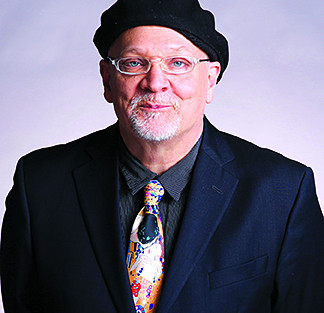 UT students and faculty members will honor jazz pianist Tad Weed with a special concert. “Tad Remembered” will be held Wednesday, Feb. 20, at 7 p.m. in the Center for Performing Arts Recital Hall. Weed, associate professor of music, lost his battle with cancer Aug. 22. He was 61. He joined the UT faculty as an assistant professor of jazz piano in 2011 and was promoted to associate professor with tenure in 2017. Weed taught jazz piano, arranging and improvisation, and was co-director of Vocalstra, a vocal jazz ensemble founded by legendary singer Jon Hendricks. Weed’s discography contains more than 30 recordings that feature his playing, arrangements and compositions. He toured with Anita O’Day and Carmen McRae; for more than a decade, he was the music director for Paul Anka. The list of artists he performed with included Chaka Khan, Jack Jones, Betty Carter, Wynton Marsalis, Frank Morgan and David (Fathead) Newman. The concert will feature a host of performers: the UT Student Jazz Combo and UT music alumni, including Matt and Atla DeChamplain, Will Bennett, the group Talking Ear, Estar Cohen, Travis Aukerman, Ben Maloney and Dan Palmer. UT music faculty also will perform: Norm Damschroder, Ellie Martin, Dr. Olman E. Piedra and Jay Weik. An added treat will be a special video encore of Weed performing with UT music student Isabella Weik. Songs to be performed include “The Road Leads,” music by Weed with lyrics by Cohen; “Cowboy Poetry Life” by Weed; “Just One of Those Things” by Cole Porter; and “When You Wish Upon a Star” by Cliff Edwards. This performance is the 2019 Art Tatum Memorial Scholarship Concert. Proceeds from ticket sales will benefit the scholarship program. 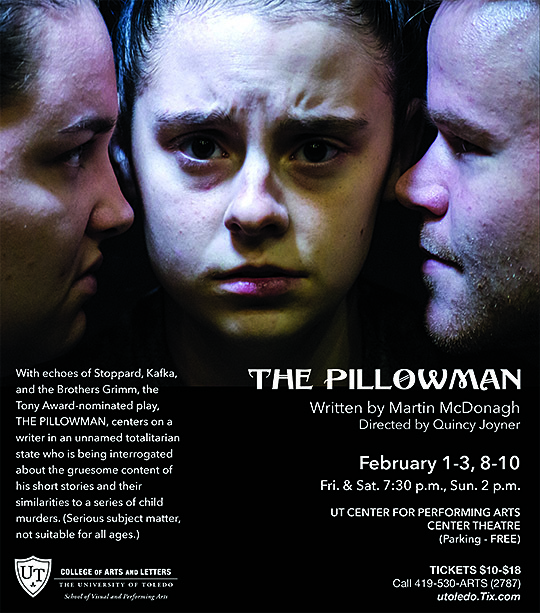 Tickets are $15 for general admission; $10 for UT employees, alumni, senior citizens, and veterans and members of the military; and $5 for students and children. Tickets are available at the door, but purchasing them in advance is recommended. 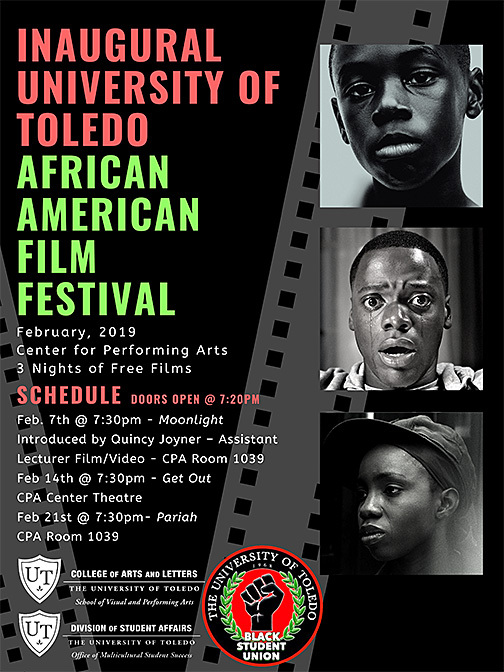 They are available on the School of Visual and Performing Arts website, or by calling the Center for Performing Arts Box Office at 419.530.ARTS (2787). During the concert, parking is free in the lot across from the Center for Performing Arts. Pianist Sara Davis Buechner is coming to town to perform with the Toledo Symphony Orchestra Friday and Saturday, Feb. 22 and 23. Before that, she will stop at the UT Center for Performing Arts Recital Hall to chat with students, faculty and community fans Tuesday, Feb. 19, at 7 p.m.
At this event — co-sponsored by the UT Department of Music, the UT Department of Women’s and Gender Studies, and the Toledo Symphony Orchestra — Buechner will share her experiences as a musician and the inspiring story of how her gender transformation impacted her career. A Steinway also will be on hand in case she feels moved to give a concert preview. Buechner also will present a master class for students Tuesday, Feb. 19, at 3 p.m., in the Center for Performing Arts Recital Hall. Admission to the talk and the master class is free. Buechner has performed in every state and province of North America — as recitalist, chamber musician and soloist with top orchestras, including the New York Philharmonic, San Francisco Symphony and Philadelphia Orchestra; and in venues such as Carnegie Hall, the Kennedy Center and the Hollywood Bowl. She has toured throughout Latin and South America and Europe; and she has a special following in Asia, where she has been a featured soloist with the Sydney Symphony, New Zealand Philharmonic, New Japan Philharmonic and Shanghai Philharmonic, among others. Buechner has released numerous acclaimed recordings of rare piano music by composers such as Rudolf Friml (“a revelation” — The New York Times), Dana Suesse, Joseph Lamb, Joaquín Turina, Miklós Rózsa and Ferruccio Busoni. Stereophile magazine selected her Gershwin CD as Recording of the Month, and her interpretation of Hollywood piano concertos won Germany’s coveted Deutsches Schauplatten Preis. Most recently, her recorded traversal of the score to Carl Dreiser’s 1925 silent movie classic, “Master of the House,” is available on Criterion Collection DVD. She joined the faculty of Temple University’s Boyer College of Music and Dance in 2016, after previously teaching at the Manhattan School of Music, New York University and the University of British Columbia. 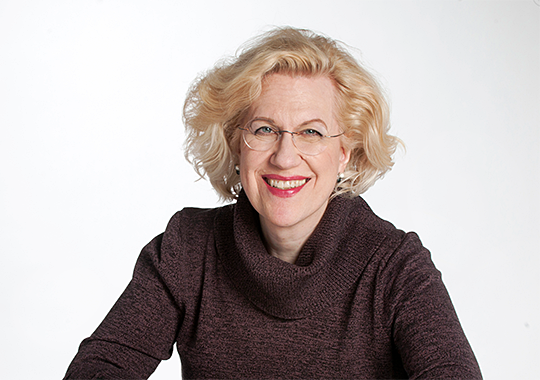 She has presented master classes and workshops at major pedagogic venues worldwide, adjudicated international piano competitions, and is a contributing editor for Dover Publications International. As a proud transgender woman, Buechner appears as a speaker and performer at LGBTQ events and has contributed interviews and articles about her experience to numerous media outlets worldwide. 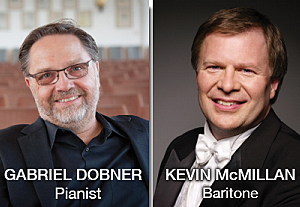 The University of Toledo Dorothy MacKenzie Price Piano Series will feature guest pianist Dr. Gabriel Dobner and baritone Kevin McMillan to perform Franz Schubert’s “Die Schöne Müllerin” (“The Miller’s Daughter”). The free concert will be held Sunday, Feb. 10, at 3 p.m. in the Center for Performing Arts Recital Hall. Dobner and McMillan also will present a free master class Saturday, Feb. 9, at 10 a.m. in the Center for Performing Arts Recital Hall. The recital program will be “Die Schöne Müllerin op. 25, D. 795” by Franz Schubert. Also known as “The Miller’s Daughter,” the work is based on poems by Wilhelm Müller that tell the story of a young man who pursues to the bitter end his love for a miller’s daughter. Both Dobner and McMillan are on faculty members in the School of Music at James Madison University in Harrisonburg, Va.
A professor of piano, Dobner joined the faculty at James Madison University in 2001. Previously, he taught at Indiana University and the Nürnberg/Augsburg Hochschule für Musik in Germany. He received his bachelor’s degree in piano performance from Chicago Musical College of Roosevelt University. Dobner then went on to Indiana University in Bloomington and earned master’s and doctoral degrees. Dobner has recorded and performed nationally and internationally. He performs regularly with pianist Lori Piitz as part of a piano duo. These musical collaborations have led to concerts in many major venues throughout the United States — including an appearance at the Kennedy Center in Washington, D.C. — as well as in Europe and Japan. After preliminary schooling at the Universities of Guelph and Western Ontario in Canada, McMillan studied at the Britten-Pears School in England and earned a master’s degree at the Juilliard School in New York. His primary focus has always been the oratorio and orchestral repertoire, and his vocal flexibility and scholarly musicianship have afforded him a broad range of styles and periods — from Monteverdi and Bach to Britten and Penderecki. McMillan joined the faculty of James Madison University in 2009. Critics have praised McMillan’s “elegant lyric baritone voice” and “singularly remarkable interpretive skills” in appearances with virtually every major North American orchestra, including the New York Philharmonic, the Boston Symphony, the Cleveland Orchestra, the Philadelphia Orchestra, the Los Angeles Philharmonic and the San Francisco Symphony. He also has established a presence in Europe, with appearances in London, Berlin, Barcelona, Paris and Prague. 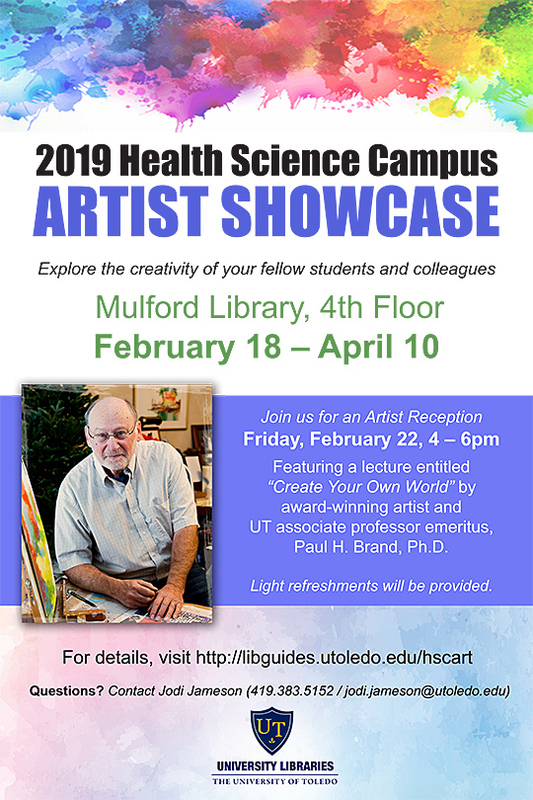 For more information, contact Dr. Michael Boyd, UT professor of music, at michael.boyd@utoledo.edu or 419.530.2183. 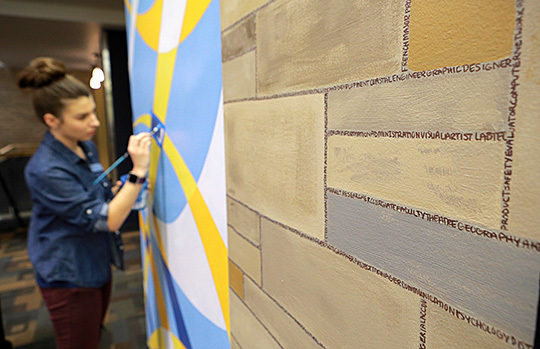 The creations of University art students are on display throughout the Toledo area for the next several weeks, appearing on electronic billboards as part of an annual exhibition. Each fall, Barry Whittaker, UT associate professor of art, organizes the exhibition of juried student work. The digital billboard space was donated by Lamar of Toledo. A total of 19 works from 14 artists are featured in the exhibition. The digital billboard locations are at Reynolds Road at Airport Highway, Glendale Avenue at Byrne Road, Tremainsville Road at Laskey Road, Washington Street at Huron Street, Woodville Road at East Broadway Street, the Anthony Wayne Trail at Western Avenue, I-75 at Berdan Avenue, and I-75 at Monroe Street. Works on the billboards were created by 14 student artists: Austin Baker, Donna Beauregard, Taylor Carey, Colin Chalmers, Jason Chappuies, Alaina Coote, McKenzie Dunwald, Chen Gao, Lindsay Haynes, Alexa McLaughlin, Tyler Saner, Ashley Simmons, Valerie White and Lydia Yant.